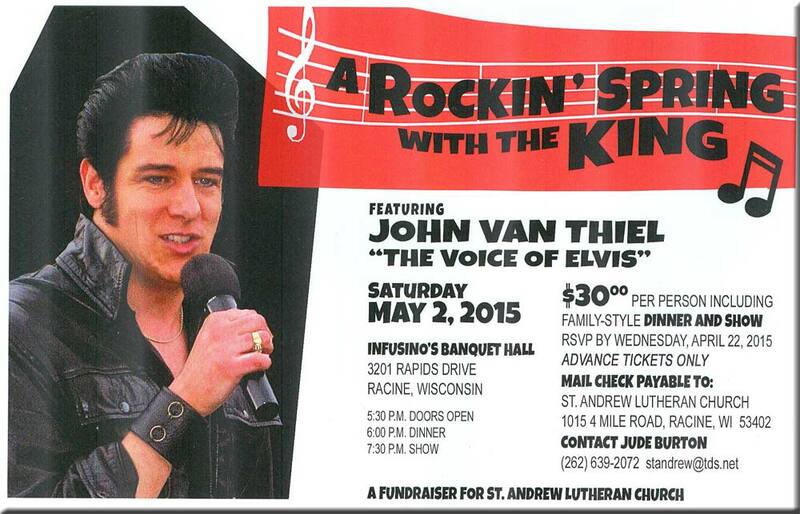 St. Andrew Lutheran Church invites the community to “A Rockin’ Spring with the King,” featuring John Van Thiel, “The Voice of Elvis,” Saturday, May 2 at Infusino’s, 3201 Rapids Drive. Doors open at 5:30 for the $30.00/person dinner and show. Tickets are sold in advance only. RSVP to Jude Burton, 639-2072, standrew@tds .net by Wednesday, April 22, and send checks payable to St. Andrew Lutheran Church to 1015 Four Mile Road, Racine, 53402. The event is intended to raise funds for celebration of the congregation’s 50th anniversary in June.